Details: Mary Beale (nee Craddock) was the daughter of the Reverend John Craddock, rector of Barrow, and married Charles Beale, Lord of the Manor of Walton, Buckinghamshire, in 1652. She studied under Robert Walker and was much influenced by her friend Peter Lely, whose work she copied and whose patterns she used. Her active work started in London in 1670 and she enjoyed considerable success during the 1670’s and 80’s. Her work is typified by rich colouring. The draperies were frequently painted by her son Charles, also a portrait painter. The eyes of her subjects are usually almond shaped. She painted many of the leading personalities of the day including members of the court of King Charles II. This interesting portrait is clearly in her style and has been attributed to her by Messrs Christies. It is said to be of Mary (Moll) Davies, one of King Charles II mistresses who bore him a daughter, Mary Tudor, later Countess of Derwentwater. Mary herself had an aristocratic background; she was the natural daughter of Charles, 2nd Earl of Berkshire, brother of Sir Robert Howard and brother-in-law of the poet Dryden. 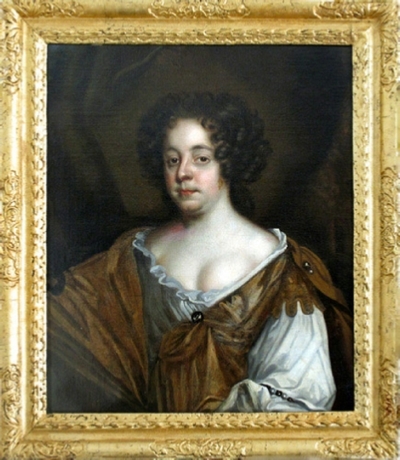 Many portraits of her exist, the most famous by Lely of 1670 in the collection of the Earl of Bradford, and a 1674 example, also by Lely, in the Western Park Foundation, and one in the National Portrait Gallery. Lely tended to be very mannered in portraiture and facial features are often stylised. He was very “kind” to his sitters. Mary Beale was rather more realistic and allowing for this and that fact that Mary Davies, to quote a contemporary source “soon outlived the facial attraction she once had”, we are reasonably satisfied that the Beale portrait is of Mary. It was painted circa 1680 and visibly portrays the deterioration of her looks.